Spa-Francorchamps, Belgium (AP) — Sebastian Vettel made a crucial early overtaking move on Lewis Hamilton to win the crash-marred Belgian Grand Prix on Sunday and trim his rival’s overall lead. It came moments after Fernando Alonso’s McLaren flew through the air and landed on top of Charles Leclerc’s Sauber. Leclerc, unharmed, was likely spared a head injury by the protective halo device surrounding the cockpit area of F1 cars. Vettel’s 52nd career win closes the gap to Hamilton to 17 points heading into next weekend’s Italian Grand Prix at Monza — Ferrari’s home. Moments after his victory, Vettel removed his steering wheel and held it aloft, almost like a trophy, as he stood on his car to celebrate. Then he jumped into the arms of his mechanics and grabbed a Ferrari flag. With eight races remaining, it was a crucial win to halt Hamilton’s momentum. Hamilton’s teammate Valtteri Bottas, starting near the back after being penalized for too many engine changes, overtook Sergio Perez late on to place fourth. Vettel’s Ferrari teammate, Kimi Raikkonen, and Red Bull’s Daniel Ricciardo both retired. The heavy crash at the start happened when Hulkenberg bumped into the back of Alonso, sending Alonso’s McLaren spinning and then flying up in the air. Verstappen, meanwhile, displayed his usual slick overtaking by getting past Ocon and making light work of catching Perez to move into third — delighting the orange-clad Dutch fans congregated around the 7-kilometer Spa track nestled in the Ardennes forest. Ferrari’s greater speed on the straights helped him pad that advantage out within a few laps, and he coasted home. 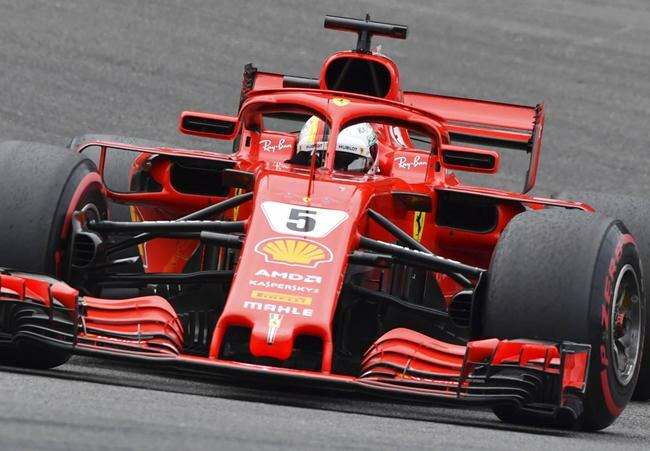 Both drivers have five wins this season as they seek to win a fifth F1 title and move level with Argentine great Juan Manuel Fangio, and move within two of Schumacher’s all-time record.